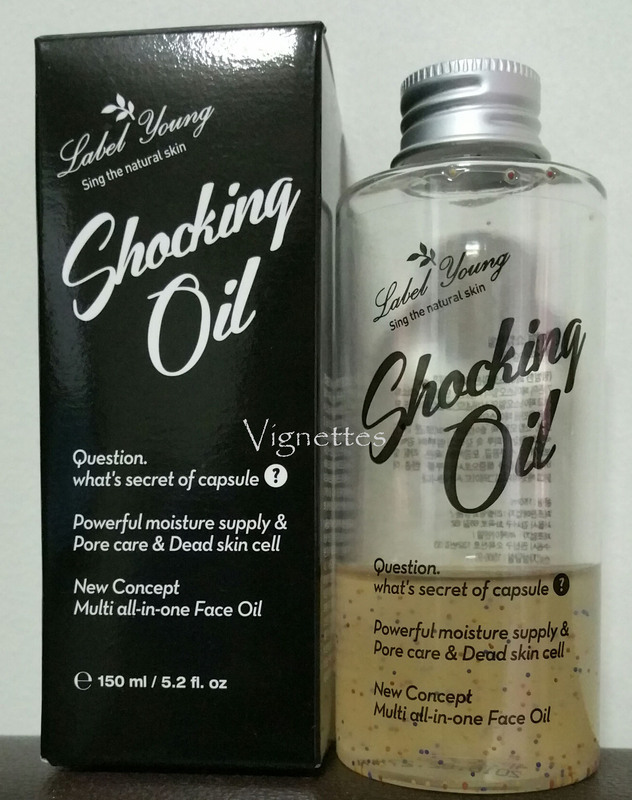 My Label Young Shocking Oil only has a third of the bottle left so I think I should provide my review on this product to those of you who are still thinking whether to grab this product or not. The uniqueness of the Label Young Shocking Oil is that this product does not feel like the oils you see in the market. Yup you heard me! It does not feel like oil but more like dense gel that becomes watery when it comes into contact with your hands. However, it delivers similar levels of moisture just as how other oils would. The product is light yellow clear liquid with tiny red, blue and yellow beads that breaks open to deliver vitamin A (moisture and nutrients), vitamin C (tighten pores and increase pore resilience) and vitamin E (keratin and ringworm CARE) respectively. Its always a surprise what colour beads are discharged from the bottle each time I pour out the contents from the bottle. According to the product publicity, the product can be used to moisturize your hair ends, and to moisturize dry patches of skin on the body, and mixed with your bb creams to create a dewy effect. I have combination skin that is oily inside but mildly dry on the surface. I have also mentioned in my earlier post that I am a proponent for use of facial oils. With Label Young Shocking Oil, I usually pour a bean size (size of 10c coin, or abt 1cm in diameter), spread it between my palms to break the beads and to warm before I apply it directly on my skin with light massaging strokes. The skin does not feel sticky after application, and I also did not experience any outbreaks after a few days of use. There will be days when I get a little lazy and decide to apply the oil directly on my face instead of applying it after toner. Both methods worked for me. On using the product with other toners, I have used Albion Skin Conditioner in place of Label Young Shocking Toner with no side effects or outbreaks. Overall, I continue to receive the hydration from this product for 3 to 4 hours in humid environment. However, if you are working in dry, low humidity or airconditioned environment, I would recommend to follow on with one of the Label Young Shocking Creams or a light hydrating moisturizer for added layer of hydration. I have not tried this on my hair ends but I did try to use it to hydrate dry patches on my body. No irritations experience. I must say this is quite a good product if you need a quick surge of moisture, especially on days where you feel the skin is dry or flaky. According to the sites selling this product, you can mix the Label Young Shocking Oil with your BB Creams to create a dewy effect. 1) Koreadepart – this online shop carries multiple brands of korean skin care products. I have had a recent Label Young haul from here. 2) Qoo10 – Search for “label young” or “labelyoung” and you should find a few vendors carrying their product range. This is not a new product so it should not be difficult to find it on Qoo10. 3) Label Young Official Online Shop (Korean) – If you can understand Korean, this is the site for you regardless of where you are. They have the most up to date Label Young product ranges on this site.